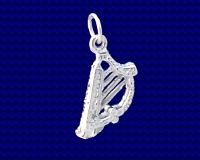 Sterling Silver Scottish Bagpipe charm. Bagpipes have existed in various forms across Europe into North Africa for possibly as long as 3000yrs. 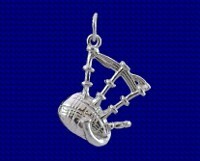 This Sterling Silver Bagpipe charm is of the most widely known Scottish bagpipes which have over the last few hundred years become a symbol of Scotland and whose haunting tones are known across the world. Approx. size 15mm x 17mm.